A baby boomer was born in Chicago named John Starks (a.k.a. "Lil J") to John & Wanda Starks, along with his two younger sisters. My Mom believed it would be in my best interest if I knew how to cook. One of my earliest memories is standing on a step stool at the stove watching my Mom cook and asking questions. I have been cooking for years for family & friends and it's a hobby, as well as for the love of serving good food. It was formerly a command center for the San Bernardino Police Department -- which seemed to fit perfectly the theme of the Super Dawg crime fighting hero of a food truck, feeding hungry people. While growing up I was always taught to give back -- I served in the U.S. Air Force as a Security Policeman and I served as a law enforcement officer in Minnesota. I left law enforcement to become an educator starting in elementary school, through middle and high school serving in 3 districts. I also worked in the private sector teaching adults how to use computer software. My career in those two fields has lasted over a quarter of a century. 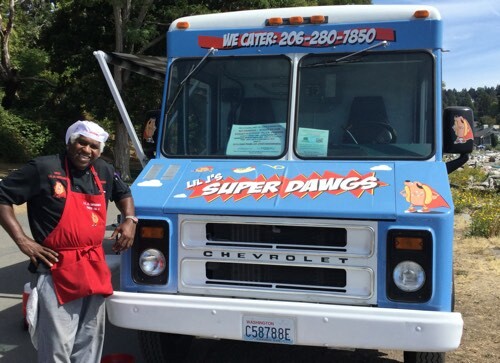 Now we embark on a new journey to continue to give back to our family, community and the world by serving quality food with excellent customer service and professionalism from Lil J's SuperDawgs.